The Berlin-based art duo Elmgreen & Dragset are installing a big sculpture of an upturned 1950s-California-style suburban swimming pool (complete with a diving board) on Fifth Avenue, across from Saks, next month, apparently to get us all geared up for summer. “One can dream of lazy days under the sun while surrounded by all the traffic and business going on at Rockefeller Plaza,” they explain in one voice, via a press release. Thanks, artists! The pool is being put in by the Public Art Fund, which brings us these temporary monuments. (Years back, to great success, it brought Jeff Koons’s Puppy to Rockefeller Plaza — which, in 2009, Jerry Saltz called the “artwork of the decade.”) Michael Elmgreen and Ingar Dragset have been creating cheeky and sly work together for more than 20 years, and they’re probably best known, at least in photographs (including Beyoncé’s Instagram), for Prada Marfa, which is a Potemkin storefront they built in 2005 in the rural Texas town that’s home to minimalist artist Donald Judd’s foundation and has become a kind of art-world holy site. Last year, they installed a ten-foot-tall bronze telescope on the High Line, pointing south toward the harbor — but blindly, since it’s nonfunctional. 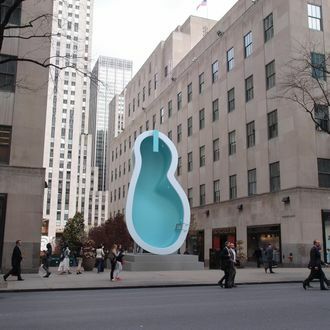 It’ll be there, taunting midtown office workers with both its inexplicability and the impossibility of recreation, until June 3, by which point it will finally be warm enough to swim in an actual pool.